"Living with the Dead: Manila's North Cemetery"
Philip Andrews, - "Last Days: Final Flights of the Space Shuttle"
Khaled Hasan, - "Tears of Memories, Death of Dreams"
Bharat Choudhary, - "The Silence of 'Others'"
Adam Lau, - "Whale Warriors"
Matt Lutton, - "Only Unity"
I am applying for the POYi Emerging Vision Incentive to continue my project Living with the Dead: Manila's North Cemetery. In the center of this bustling city of 11 million people, lies the North Cemetery. The final resting place of several Filipino Presidents, celebrities, and hundreds of thousands of the city's Catholic dead, the cemetery is also home to a living community of more than 2,000 people. In contrast to cemeteries in the west, the North Cemetery is a busy and vibrant place. The vast and complex network of streets and alleys is tightly lined by tens of thousands of mausoleums and tombs - many of which are inhabited. Yet this is still a fully functioning cemetery, with up to 80 funerals taking place each day. The community here is strong and the stigma attached with inhabiting this location has allowed a unique "gated community" to grow. Indeed, the resting place of the dead is the foundation that the living now depends upon. 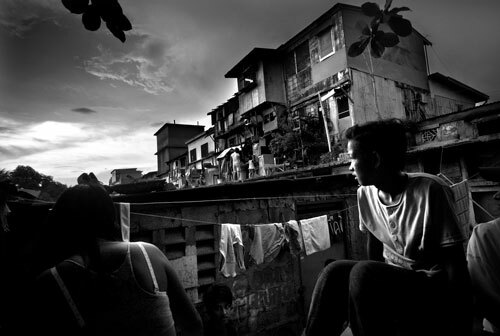 This project aims to reflect the resiliency of people who lack stable housing and community infrastructure within Manila and what it takes to live in this unique environment. It is an inspirational example of people making the best out of very little, as well as an alarm bell for human rights activists, as it shows how difficult it is to find stable housing due to extreme poverty and overcrowding in the city. I have spent one month working in Manila producing establishing shots of the location and community, and most importantly forming the relationships that will make this project a success. However, I have only started to scratch the surface of the rich story that exists there. Of the few projects I have seen from the cemetery most appear to have been short-term and tend to sensationalize the situation due to the surreal location. This tells us little about the residents themselves and the challenges they overcome daily due to a lack of formal infrastructure. So far due to limited resources I have been unable to progress much past this myself. It is very important that my work doesn't fall short in this manner. The location is only one element of this story. I remain inspired by the residents' resourcefulness, strength and courage and I believe it is of great importance to produce a truthful in-depth document on this fascinating community by focusing deeper into the lives of some selected residents. I have already identified a set of subjects that represent a good cross section of the community. I started to work with these individuals on my first visit and have therefore developed the relationships that are necessary to make this a success. The symbiotic relationship/co-dependency between the living and the dead - how/why the cemetery supports living residents and in turn the role of the residents in this relationship. What it takes to live there and if the cemetery is a better option than living in the city slums. The Criminal Element. The cemetery is also known as a "safe haven" for petty criminals and drug dealers. They cycle of life at the cemetery - babies are born as bodies are laid to rest. Although a public cemetery, foreign visitors and professionals are required to apply for a permit from the Mayor's office to visit, and are often escorted by a member of the security team. I understand the implications of shooting in this location; this initially took some time to establish (over a week of visits to City Hall to obtain the necessary paperwork). Also, and more importantly, I have already built a strong relationship with many of the residents and now have the friendship and trust of the authorities in charge. I feel my knowledge of the site, its residents, the City Administrator and the security team is of great importance. This eliminates the likelihood of logistical failure and/or delays and means I can hit the ground running. I have tried to raise support to finance the continuation of this work through various awards. I have seen significant successes in that my work has been recognized by such respected awards (and resulting exhibitions) as the Grand Prix CARE du Reportage Humanitaire, the Anthropographia Award for Photography and Human Rights and the Freelens Award/Lumix Festival for Young Photojournalism - yet finishing as a finalist in all of them, I have fallen just short of receiving any financial reward that I can invest in the project. However, these successes have served to assure me that this project is very worthy, which only makes me more passionate about continuing my work. I believe I have the necessary infrastructure in place to develop this project to its conclusion - from photographing to the works ultimate distribution. However, I can only make this project a success with the necessary financial support. This image: A young boy gazes over the tombs and graves that surround his mausoleum home. A population of over 2,000 people currently resides in Manila's North Cemetery, forced to inhabit this surreal environment due to the city's extreme poverty and overpopulation.